The death toll in Kyrgyzstan’s southwest is rising precipitously, with the official toll at 113 killed over 3 days, and some human rights groups warning the toll might be upwards of 500. “They are killing Uzbeks like animals. Almost the whole city is in flames,” one human rights worker reported. Between attacks by pro-government gains and police orders to “shoot to kill” Uzbeks are pouring out of the region in enormous numbers. As of this morning more than 75,000 of Kyrgyzstan’s minority Uzbeks had arrived in neighboring Uzbekistan, with more coming all the time. Those fleeing are claiming that there is “genocide” in the city of Osh, the center of the violence. Kyrgyzstan saw its pro-US ruler Kermanbek Bakiyev ousted in April, after he ordered police to kill Kyrgyz protesters in the capital of Bishkek. The new violence is, ironically enough, coming from the pro-Russian interim government that loudly condemned Bakiyev’s human rights violations, but is now ordering a virtually identical crackdown against pro-Bakiyev protesters in Osh and other southern cities. The violence also has a racial component. After Bakiyev’s ouster many of the Kyrgyz protesters turned on Bishkek’s Uzbek minority, forcing many to flee to the Uzbek-majority south, and taking their resentment with them. Since then southern Kyrgyzstan has seen on-again, off-again protests in support of Bakiyev and against the new interim government. As the latest protests grew, however, they saw counter-protests in Bishkek, of government supporters looking to raise forces to attack the Uzbeks in the south. This has predictably led to violence, and the government has ordered police and troops down to “restore order,” though at this point it seems they are largely joining into the crackdown on the Uzbeks. The new government has pressed Russia to send troops to help with the crackdown, and while Russia initially declined this request, they say now that they will send some additional troops to protect the Russian military base in the nation. Either way, a pair of bloody government crackdowns on protesters appears to have set the stage for irreconcilable differences between Kyrgyzstan’s Kyrgyz majority and the 750,000 strong minority of Uzbeks, and violence with no end in sight. 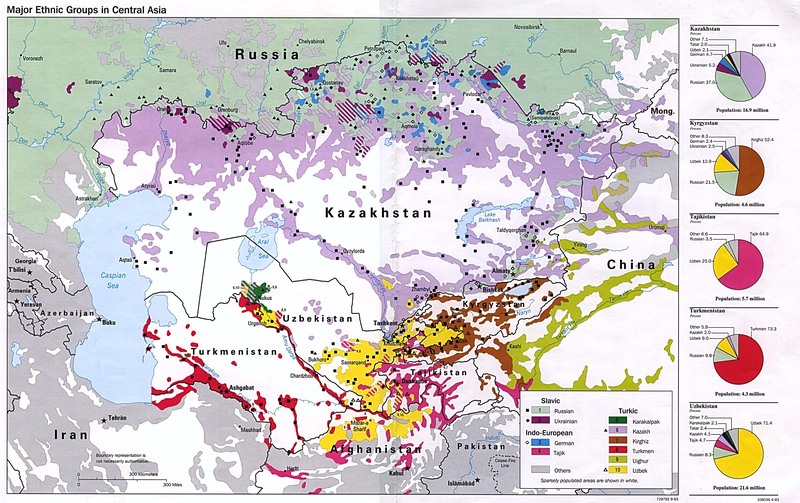 It is where the Kyrgyzstan's Uzbeks are concentrated, but they don't make up the majority. So much for diversity being strength.